I don’t have a wide, wood planked front porch. I don’t have rocking chairs or hanging ferns or a porch swing. My porch is not cottage-y or farmhouse-y. And there are times that I really wish I had a bigger porch. Maybe a wrap-around one with ceiling fans and the perfect seating arrangement for sipping iced tea while watching the neighborhood happenings. And while my porch doesn’t have any of those things, I’ll tell you what it does have. It has a two-story high arch, creating a kind of enclosure. My kids have often referred to it as the tunnel. And do you want to know something? That enclosed, tunnel-like space is perfect for me. It’s perfect because it is where I go in the wee hours of a crisp, fall morning when it’s finally cold enough to see my breath and the incredible autumn sunrise. It’s perfect because since it’s kind of enclosed and tunnel-ish, no one can see me standing there in my robe and slippers. It’s perfect because I can lean against the wall and just…breathe. The coffee I’m clutching in my hand has already begun to do it’s job but it doesn’t hold a candle to how awake, how alert, how alive I feel as my lungs are filled with the cool air. More and more lately, I’m finding myself craving those moments. Sometimes it’s because I’m needing breaks from book writing and a way to feel like I’m in touch with a world that exists away from my laptop. A world where the air actually moves around. Sometimes, it’s because I need an escape from helping my son with 6th grade math since it regularly sends me back to that scary, dark time in my life where I had to pray my way through each math class and long for the days when I would never have to solve an Algebraic word problem ever again….or so I thought. In my opinion, having to help your children with the same school subjects you detested is one of life’s most cruel jokes. Mostly, though, I’m just needing a moment. A simple, quiet moment. One where I can take off my mom/wife/blogger/author/speaker/taxi driver/cook/housekeeper/homework helper hat. One where I can just be…me. A moment where, with the steam coming off of my coffee mug and the sun coming up over the hills in the distance, I am reminded of just how very small I am in this world. And yet, in that same moment, I’m reminded of just how very big is the love my Heavenly Father has for me. Sometimes I get five minutes out there on my stucco-y porch. Most days I get closer to one minute. But in that one glorious minute, standing there while the cool fall air envelopes me, I am refreshed, renewed and readied for the hours, minutes, seconds ahead. 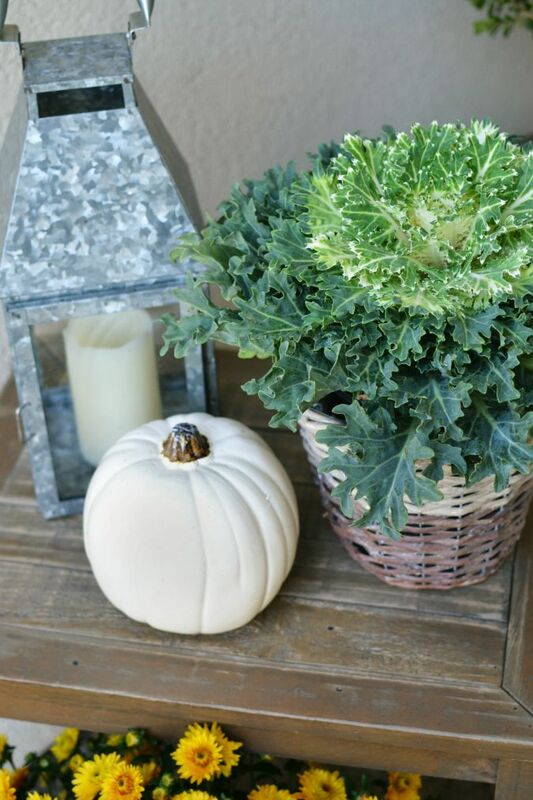 41 Comments on "Fall Front Porch 2015"
You porch is so pretty, Vanessa! And it’s made all the more beautiful by the picture of you! Dear Vanessa, you are being a good steward of what the Lord has given you…and you are a blessing to others. Beautiful, Vanessa! 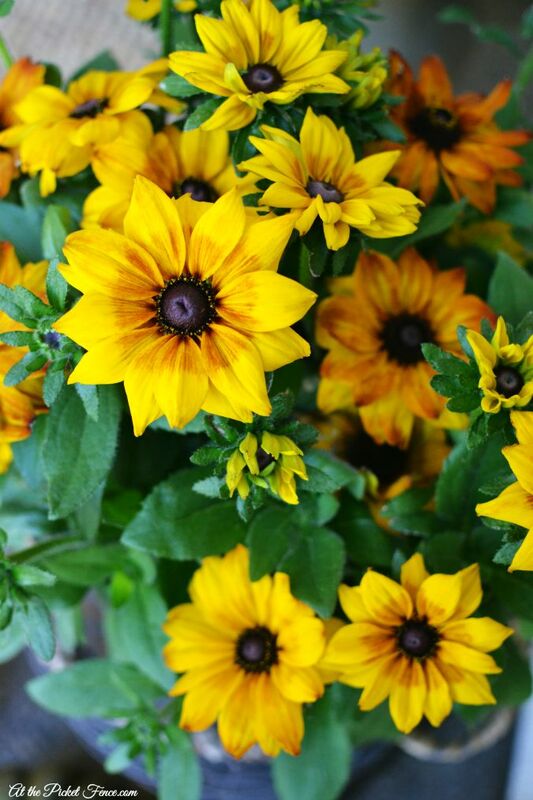 Love the variety but not too busy… enjoy your day! I love that you have something different. Blog world is a lot of the same farm house and cottage looks. Its nice to see ideas for others who do not have that style of home. Your front porch is perfect…and I think I do see enough room for a small rocker if you should ever need one. Your front porch, tho it be small is MOST inviting. I definitely need to add those to my bucket list June!! Thank you for your kind words and I’m thrilled if I could help get your creative juices flowing. Blessings to you! 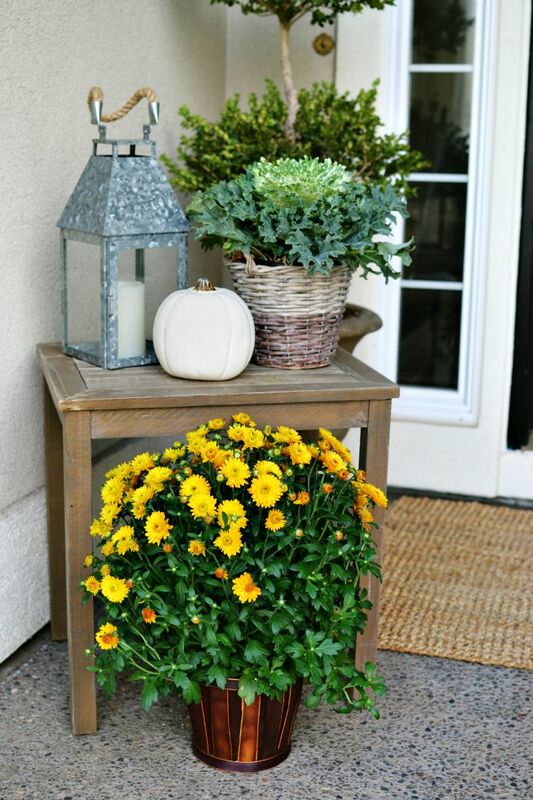 YOU and your front porch look just beautiful together… enjoy the SONshine !! Awww…thank you so much Jayne! Your porch is amazing and you are making me want to live in Oregon. Where I can get some of that crisp air. And I can wear sweaters. Oh how I miss sweaters!!! September in SoCal means constant praying for gratitude as I can no longer stand to wear tank tops and pay $500/month to run my air conditioning 24/7. Can’t wait for the book to come out! I like your front porch and it’s decorated beautifully. 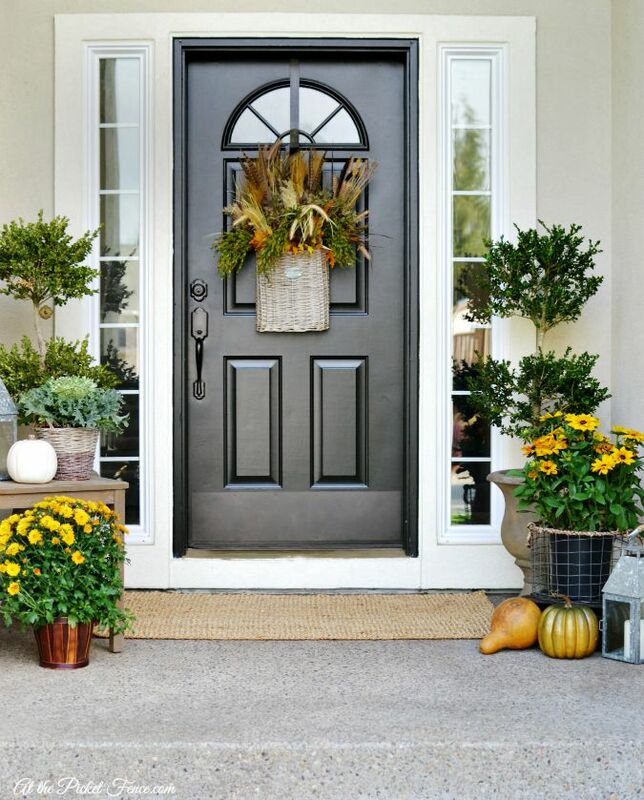 I have a similiar, more simply decorated front porch. I love my front porch, too, especially in early spring when the sun is shining. I sit on the step, just like you, and soak it all in. Those are some of the best moments aren’t they Lisa? Thanks so much for coming by! You’ve inspired me to look at my “tunnel” with greater respect…I can make it pretty at the doorway if for no reason other than for me. I can enjoy it at day’s end when (if I’m lucky) I can see a bit of a sunset and reflect on God’s magnificent color pallet. What a sweet and unexpected thing to say! Made my long day! Lovely post, very pretty stucco-y 🙂 porch, beautiful YOU, and all glory to our Lord! 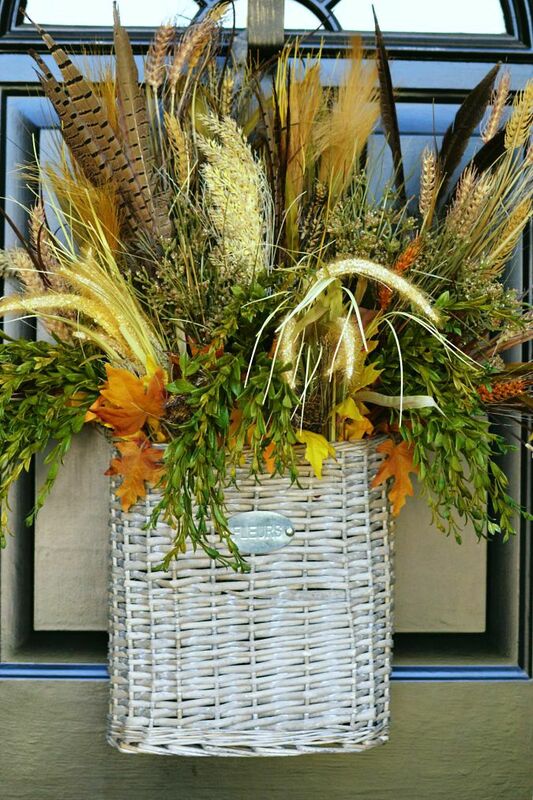 Happy Autumn!!! Thank you so much Libby for your kind words! Happy Autumn to you too! Your little porch reminds me of my husbands childhood home. They had a similar porch that they lovingly called “The Nugget”. Thanks for inspiring us all to decorate the entry’s to our homes. 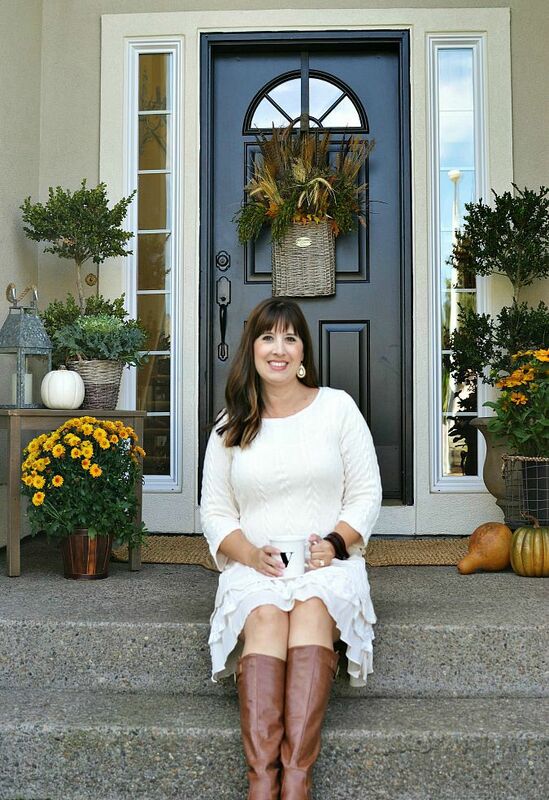 Such a beautiful post, Vanessa.i can truly feel the peace you describe standing at your front porch- which is lovely! This post is the best I have read in a very long time!!! It is refreshing, full of genuine thoughts and reflective of every woman’s daily routine past, present or future. I just love it and the porch that inspired it!!! I love your porch Vanessa! 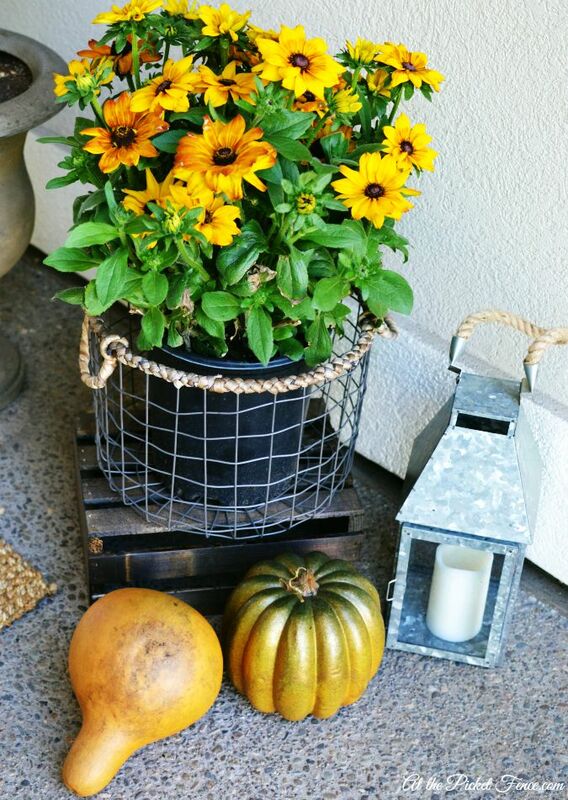 All the great things for fall are on your porch & you look beautiful!!! I love your upbeat & real self!! Happy Wednesday!!! Oh thank you so much Paige!!! You are the sweetest! hey pretty lady on her pretty porch! Your porch is beautiful and so are you! I love those quiet (rare) morning moments – only it’s my back porch that is my morning place. Thanking God for His blessings and watching His world come alive!